This year’s 60-day legislative session ended on time on March 8 with a flurry of activity in the final days of the session. Overall, the session was characterized by significant movement on several issues that have been stalled in recent years. Democrats took full control of state government for the first time since 2012, and Democratic priorities involving (among others) gun control, gender pay equity, net neutrality, voting rights, mental health, campaign finance legislation and abortion-related insurance coverage were enacted. Some legislators rightfully complained that Democratic leadership rushed the legislative process, using creative maneuvers to limit debate and push legislation through quickly. 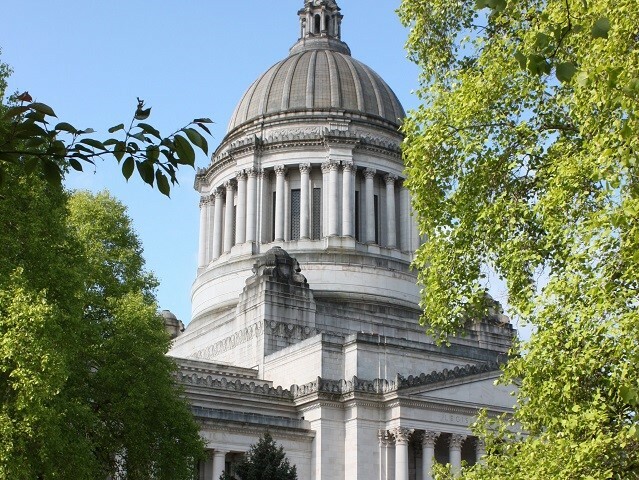 Fueled by a strong economy that boosted state revenue projections, Democrats passed a supplemental operating budget package that will cut statewide property taxes by 30 cents per $1,000 assessed value and fully fund teacher salaries as required by the Washington Supreme Court. Lawmakers hope that by putting nearly $1 billion more into schools this year, the court will find the state is no longer in contempt of court in the McCleary school funding case. Money that would have gone into the state’s rainy-day fund was diverted to pay for both programs, frustrating legislators who found this maneuver unconstitutional and issued calls for greater financial restraint. In a sign of the strong economic times (and the fact that this is an election year), the Legislature considered but did not pass any new taxes. Perhaps the most notorious misstep of the session was the Legislature’s approval of a bill that would have exempted lawmakers from Washington’s voter-approved Public Records Act. With the consent of both parties, the bill went from introduction to passage in 48 hours, without public hearings or floor debate. After 20,000 people contacted Governor Inslee’s office to protest the move and many legislators who originally voted for the bill asked to start over, the governor vetoed the legislation. The below report provides session highlights on AIAWA issues and others. Thank you to all AIAWA members who took the time to meet with or contact your legislators over the past year. These connections are invaluable as we advocate on behalf of architects in Olympia. 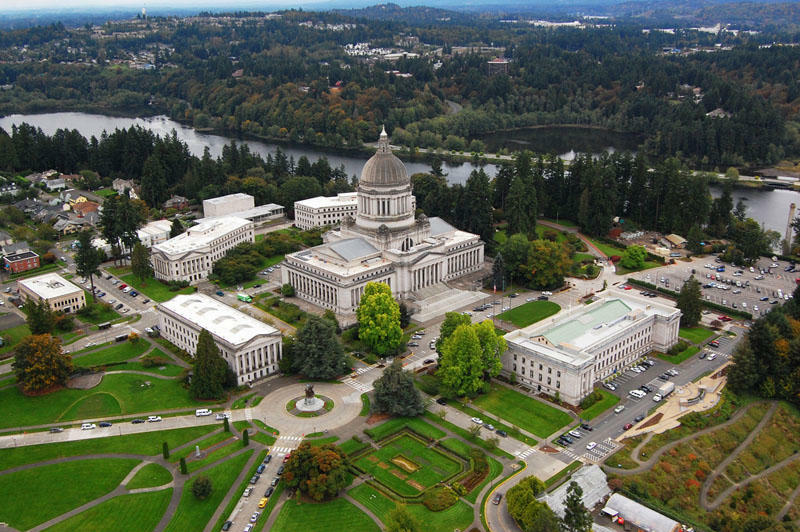 After a year-long delay, the Legislature approved Washington’s 2017-18 capital budget in January, an event heralded by architects and others across the state who depend on the $4.2 billion construction spending plan for major projects. The impasse was broken when Democratic and Republican negotiators reached an agreement on a fix to address the 2016 state Supreme Court ruling on rural water rights known as Hirst. Governor Inslee signed both bills into law on January 19. On the last day of the session, the Legislature passed a Supplemental Capital Budget that includes additional funding to account for higher project prices as a result of the delay. AIAWA had strongly advocated for this extra funding, which was provided in the House version of the Supplemental Budget but not the Senate’s. The final budget drew more heavily on the House version. Wrongful injury or death SB 6015, a bill that would have broadened the number of plaintiffs who can sue for wrongful injury or death benefits as a result of a jobsite accident, passed the Senate but failed to pass the House. AIAWA opposed this bill and worked with allies to have an amendment ready to be offered on the House floor to strip out joint and several liability (where a plaintiff may recover all the damages from any of the defendants regardless of their individual share of the liability) from the bill. Without enough votes to defeat the amendment, the trial lawyers, who supported the bill, ultimately decided to pull it rather than accept the amendment. We will see this bill again next year. Public agency contracting HB 1851, introduced at the behest of the public employee unions, would have required public agencies and institutions of higher learning to perform a cost-benefit analysis comparing the cost of having the work done by agency staff to having it done by a private entity when contracting for any services. The bill passed the House but did not have the votes to pass off the Senate floor. While the original bill was aimed at managing costs at state agencies, amendments throughout the process turned the bill into one focused on protecting government employment. An effort to exempt architecture, engineering and other services was unsuccessful. This is another bill we will see again next year. NCARB licensing standards HB 2994 was introduced late in the session by AIAWA to make minor changes to the Washington statute governing the practice of architecture so as to better align our statute with current National Council of Registration Boards (NCARB) policies. NCARB works to establish uniform laws in all 50 states with respect to regulation of architects. Most states have made changes to their registration laws to bring them more in conformance with NCARB licensing policies and to make it easier for architects to obtain reciprocal licenses in other states. AIAWA had the bill introduced this year to make it easier to lobby for passage in 2019. Capital Budget project scoring HB 1325, a bill that addressed the scoring and prioritization of capital budget projects at Washington’s community colleges and universities by developing “reasonableness of cost” standards for higher education projects failed to pass the Senate. AIAWA had concerns about the legislation’s attempt to establish strict cost estimates given the wide range of variance in project circumstances related to location, site development and programmatic requirements. In addition, we found the bill’s requirements to extrapolate cost data over time by adding escalation rates to the baseline amount to be problematic. Condominium liability reform This year the Legislature began to look at ways to address the lack of condo development in Washington. With a heightened awareness of the lack of availability of a range of affordable home ownership options, legislators introduced bills that attempted to address parts of the problem. Three bills were considered to modify the construction defects statute; none were successful. AIAWA opposed HB 2475 and SB 6523, which would have marginally increased liability for architects and others. HB 2831, which AIAWA supported, would have required condo owners and HOAs to hold a meeting of the membership to determine whether a lawsuit should be brought against a construction professional (architects are included in the definition of construction professional in the construction defects statute). It also would have required the HOA to invite the construction professional to attend the meeting and be able to speak; included strict notice requirements to the homeowners advising them of the risks and benefits of pursuing a lawsuit; and most importantly required greater than 50 percent of the homeowners to authorize the lawsuit. Public Private Partnerships HB 2726, which would have allowed public private partnerships (P3) for alternative public works contracting, failed to pass out of the House Capital Budget Committee after State Treasurer Duane Davidson testified that his office viewed it as unconstitutional. AIAWA had strong concerns with this legislation and believed the issue needed more work outside of the legislative process. Efforts to address issues related to P3s on the Capital Projects Advisory Review Board (CPARB) will continue, and we will likely see new P3 legislation next year. SBCC funding HB 1622, which provides greater funding to the State Building Code Council (SBCC), sailed through the Legislature this year after AIAWA spent three years negotiating the language with other stakeholders. The bill requires greater transparency by the SBCC and includes additional cost benefit analysis requirements related to code amendments. AIAWA agreed to a $6.50 increase in architect licenses (renewed every two years) in exchange for getting the SBCC the additional funding it needs to accomplish its work. Energy code tiers HB 2931, which would have allowed local governments to tighten their energy codes to 10% and 20% above state residential energy code, failed to reach the House floor. The legislation would have allowed local governments to voluntarily choose a tier that best works for their energy reduction and climate change goals. While local governments are already able to set targets above commercial energy code, state law currently prohibits them from doing the same with the residential code. Mass timber codes SB 5450, which requires the State Building Code Council (SBCC) to adopt rules for the use of mass timber in building construction, easily passed both chambers despite opposition from concrete and masonry interests. Although the bill will not impact what is currently allowed to be built with wood, it will help with future efforts to encourage the inclusion of taller wood buildings in state code. AIAWA is currently working on an amendment request to the SBCC to ask it to revise the code related to taller buildings made of wood, and this show of legislative support will be helpful in that process. B&O tax HB 2940 would have reduced the B&O tax on small businesses but would have replaced those revenues with additional taxes on large businesses. This bill passed one House committee but failed to move further. AIAWA remained neutral on this legislation as it would have impacted member firms differently. Capital gains tax HB 2967 would have imposed a 7 percent capital gains tax while reducing property taxes for seniors, veterans and disabled persons. While AIAWA supports a capital gains tax in theory, we did not support this legislation because we prefer comprehensive tax reform in which the burden imposed by the B&O tax be lessened or eliminated. SB 6531, to amend the program that funds construction of new schools and modernizes existing facilities, passed the Senate but failed to move in the House. The bill would have expanded state funding for schools by increasing the space allocated per student and the dollar per square foot amount to more realistic levels, increasing funding for architectural fees as a result. AIAWA supported the legislation. SB 6246, which would have lowered the threshold for school bond levies to 55 percent, failed to pass. AIAWA supported the legislation. SB 6081, which would have allowed solar net metering to ensure that solar owners are able to use the electricity they make, earning full bill credits for their power. The Legislature made a $107 million investment in the Housing Trust Fund as part of the Biennial Capital Budget passed in January. The Housing Trust Fund builds and preserves affordable homes. It primarily serves people with the lowest incomes and those with special needs, including people with disabilities, families with children who are homeless, seniors, youth and young adults and veterans. HB 1570 was enacted to establish a $22 increase to real estate transaction recording fees that are paid when documents are filed. This is the state’s primary source for funding homelessness services. The increase will generate approximately $26 million each year to fight homelessness. Additionally, this bill removes the expiration date on the fee so that communities have a permanent and reliable source of funding to reduce homelessness. HB 2382 will make it easier to transfer underutilized public property so it can be used for affordable homes. HB 2444 impacts affordable homes built with federal Low-Income Housing Tax Credits, which go through a transfer of ownership when the for-profit investor exits the partnership, usually 15 years after the homes are built. No cash is involved in this ownership transfer, but without this clarification, nonprofit organizations could have been taxed on the transfer at a significant amount. This bill requires the state to continue the current practice of not charging the Real Estate Excise Tax for an additional 17 years, which allows nonprofit housing providers to keep those resources and provide additional affordable housing and services in their communities. HB 2578 was enacted to establish a ban on source of income discrimination for renters, prohibiting landlords from being allowed to refuse to rent to someone because they use rental or income assistance to help pay the rent. Affordable housing and homelessness providers spent a decade trying to get this bill passed. Sexual Harassment Lawmakers could not agree on a joint resolution to create a taskforce to address sexual harassment in the Legislature. However, they did pass three bills aimed at addressing sexual harassment in the workplace. Two of the bills would protect the right of victims of sexual harassment or assault to speak publicly or pursue a lawsuit even if they had signed a nondisclosure agreement with their employer. The third bill calls on Washington’s Human Rights Commission to develop model policies on preventing and addressing sexual harassment in the workplace. Equal Pay In the first update to Washington’s Equal Pay Act since 1943, lawmakers approved a measure that prohibits employers from requiring employees to sign nondisclosure agreements preventing the discussion of wages. The bill says employees can’t be retaliated against for sharing wage information with colleagues. It also gives employees who believe they are the victim of wage discrimination the ability to file a complaint with the department of Labor and Industries. Net Neutrality Lawmakers passed a first-in-the-nation law to prohibit internet service providers (ISPs) from blocking or slowing some internet content while giving priority speeds to content providers who pay more. The law responds to the Federal Communication Commission’s recent rollback of 2015 net neutrality rules. Under the law, ISPs that operate in Washington will have to provide equal access and disclose information about their network operations. However, the new law faces a possible challenge under the Commerce Clause of the U.S. Constitution. Gun Legislation In response to last year’s mass shooting in Las Vegas, Washington lawmakers banned bump stocks, a trigger modification device that makes a semi-automatic weapon fire more like an automatic weapon. Despite having one-party control of the Legislature, Democrats were not able to pass a proposal to raise the age limit from 18 to 21 to purchase semi-automatic rifles and to require enhanced background checks for the same guns. The bill also included provisions to address school safety. AIAWA issued a letter in support of that legislation. Death Penalty For the first time, a death penalty repeal bill passed the Senate with some Republican votes. However, the bill failed to get a vote in that House. The prime sponsor of the repeal bill was Republican Senator Maureen Walsh of Walla Walla, whose district includes the Washington State Penitentiary where our state’s death row is located. Washington currently has a governor-imposed moratorium on executions. Car Tabs For the second year in a row, the House and Senate passed bills to cut car-tab taxes but couldn’t reconcile the two versions and ended up with no final bill. Unlike the House’s bill, the Senate’s version offered some backfill funding via a sales tax on construction projects to replace lost revenues to Sound Transit. But House Republicans wanted further cuts, and they repeatedly offered amendments to the bill as time ran out on the last day of the session. If you have questions or comments on these or other issues, please contact Kirsten Smith at kirstens@aiaseattle.org or 206-448-4938 x401.